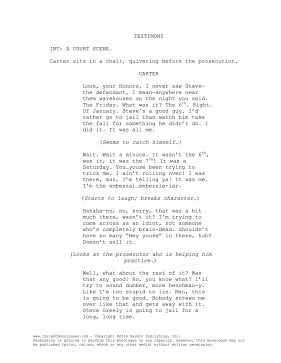 Carter practices witness testimony and perjury in this serio-comedic monologue that runs 1-2 minutes. Carter sits in a chair, quivering before the prosecution. Look, your Honors, I never saw Steve-the defendant, I mean-anywhere near them warehouses on the night you said. The Friday. What was it? The 6th. Right. Of January. Steve's a good guy. I'd rather go to jail than watch him take the fall for something he didn't do. I did it. It was all me. Wait. Wait a minute. It wasn't the 6th, was it, it was the 7th! It was a Saturday. You…youse been trying to trick me. I ain't rolling over! I was there, man, I'm telling ya! It was me. I'm the embezzal…embezzle-lar. Hahaha-no, no, sorry, that was a bit much there, wasn't it? I'm trying to come across as an idiot, not someone who's completely brain-dead. Shouldn't have so many "Hey youse" in there, huh? Doesn't sell it. Well, what about the rest of it? Was that any good? No, you know what? I'll try to sound dumber, more henchman-y. Like I'm too stupid to lie. Man, this is going to be good. Nobody screws me over like that and gets away with it. Steve Greely is going to jail for a long, long time.